Healthy human cells are the foundation of good health, and supporting these cells is critical in the pursuit of wellness. DIM is a phyto (plant-based) nutrient which is most commonly found in vegetables such as broccoli and cabbage. DIM and its precursor, Indole-3-Carbinol, have recently been the subject of extensive research as these compounds show promise in encouraging healthy cell function. Basically, DIM works by altering the "bad" forms of estrogen into a much more desirable form of "good" estrogen, which is widely regarded as being much safer. A number of recent studies suggest that supplementation with DIM can be useful in the breakdown of estrogen, and in weakening the activity of growth-prone cells in the body. Based on the research that has been conducted over the last twenty years, DIM has a promising future in cancer prevention. Exciting research is ongoing on in the area of these phytonutrients. Increasing the beneficial estrogens and decreasing the levels of harmful estrogens can benefit both men and women, improving estrogen imbalances and overall health. Men can also benefit from the supplemental use of DIM. Recent studies from the University of California conclude that, "Our results identify DIM as a potential cancer preventive and useful for prostate cancer." Estrogen metabolism slows as men age, causing estrogen to accumulate in the prostate gland. This occurs especially in conjunction with alcohol abuse and obesity. Studies show that this extra estrogen accumulates in the prostate gland and is associated with some prostate enlargement. DIM has also been found to be beneficial in relieving the symptoms of night time urination due to enlarged prostate. Caution: Do not use this product if you are pregnant or lactating, or using birth control pills. Harmless changes in urine color may occur. Increased water consumption reverses this effect. Recommended Dose: (Women and Men) Take 2 capsules daily with food. For Intensive Use: (Women and Men) Take up to double the recommended dose. 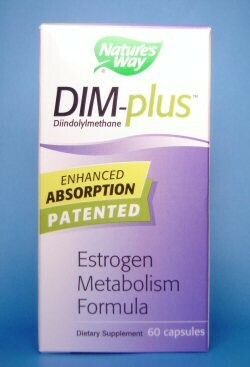 Please read DIM Shines Light on Breast Health for more information on this product. BioResponse-DIM Complex 100 mg (patented, enhanced bioavailability complex containing 25% diindolylmethane), starch, diindolylmethane, natural Vitamin E, phosphatidylcholine, silica Protectamins, spinach powder, cabbage powder, concentrated broccoli powder. Other ingredients: Cellulose, Gelatin, chlorophyll.